Netflix Lowers Price on 2-Out Plan - Price War? Netflix has dropped the price of the 2-out plan $1 to $13.99 per month. Will we see another price change from Blockbuster, when they've been rumored to be raising prices? Thanks to Todd, Eric, Chris, Michael, Budha Man, Bryan and others for sending this in. I really shouldn't say this, and I may regret it, but YES YES, we are building some ways for you to (a) see people who are the most similar to you, and (b) ways for you to save people once you've found them, no matter how you've found them. I won't go into the details here, or the precise timeline, but its a big priority for our team and I expect will be available in the near term (however you chose to interpret that). I wish more people at Netflix would blog so we could get additional insight into how Netflix works. I wonder if Blockbuster will start blogging? Is Red Envelope Netflix's Secret Weapon? Reuters has a story about Netflix's Red Envelope Entertainment division, Netflix turns on star power in U.S. DVD rental war. Netflix executives say they are taking a page from HBO and Starbucks, two brands that trumped competition with original products and a better consumer experience. "When I look back at when HBO started dabbling in original content I don't think they could tell you where it would go," Netflix Chief Content Officer Ted Sarandos said. "It has become more than a tactical differentiator for HBO. I don't know if that's where we're headed but it's a beautiful possibility." Tidbit from the story: "Red Envelope doesn't make any money for Netflix, which plows all profits back into buying more films..."
Netflix & Blockbuster Settle Patent Litigation, BB to Raise Prices? On June 25, 2007, Blockbuster and Netflix, Inc. resolved the parties' pending patent litigation. While the terms of the settlement are confidential, the parties have agreed to secure dismissal of all claims in the litigation. The settlement will have no material effect on Blockbuster's future financial performance. Consistent with its previously disclosed intentions, Blockbuster Inc. ("Blockbuster") has invested significantly in BLOCKBUSTER Total Access™ during the first half of 2007 to capture market share in the overall video rental market and to set the stage for the expected future profitability of its online rental business. Blockbuster intends to continue to focus on subscriber growth but before year-end plans to make modifications to the offering that it believes will strike the appropriate balance between continued subscriber growth and enhanced profitability. Thanks to Eric, JR & John A. for sending this in. Several readers have reported being able to drag and drop movies in their queues, but I can't use the feature on Windows or on the Mac yet. 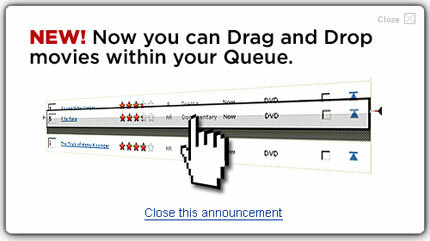 Do you have the ability to drag & drop movies in your queue? via Sean (images), Matthew, Pavel, Sean, and the Netflix Fan. Michael on the Netflix Community Blog writes that they are working on a way to hide movies in your queue from your friends. We're considering the best way to allow certain titles to be hidden. You guys are pretty sharp, and probably would be happy with a checkbox somewhere that says "hide this movie from my Friends" or the like. But we must think of the others, the folks who find every additional option on screen a distraction, or worse, confusing. So where would you say is the best place to put such a checkbox option. The Queue is out. It's not worth the complexity of another column for the one title you want to hide once every few months. It could be in the Friends area, but where? I'm afraid if we put in in a column along with Movies You've Rated, no one will ever find it. So if you want to help get this feature implemented, i'd like some good thinking about the best way to implement. Ideas? This is your chance to give them ideas on how to implement this feature, so post your ideas on the Netflix Community Blog. Adrian Cockcroft has posted links to a few interesting technical jobs at Netflix, including openings for a Senior Performance and Scalability Engineer, Sr Unix Administrator - Storage Focus, and Senior Unix Administrator - Capacity Planning & Performance Tuning. If you want to work for Netflix you should visit Jobs.Netflix.com. Generally I have close to 20 or 30 items in my queue which can be a bit daunting. I frequently find myself wondering why I put certain items on my list. Last week while watching AFI's 100 Years 100 Movies special I found myself adding tons of films and suddenly wishing I had some method of tagging everything. I think this is an interesting idea, but I'd like to be able to rank, group or sort the 481 movies in my queue. I know this is old news, but I thought it was worth mentioning here. Reuters is reporting that Blockbuster will be stocking Blu-ray titles at most company-owned stores. Blockbuster said customers have shown more interest in Blu-ray than HD DVD. Blockbuster, which has about 8,000 stores worldwide, will expand its Blu-ray disc rental inventory to its corporate-owned stores by mid-July. The company will continue to offer both Blu-ray and rival HD-DVD titles through its online rental service. Some 250 stores will carry both formats. Blu-ray rentals are "significantly outpacing HD DVD rentals," the company said in a statement. The Velocity Club lets you "rent" exotic sports cars such as the Lamborghini Gallardo Spyder, but only if you have an extra $28,500 to spare (plus a $3,500 joining fee). This is one of the more interesting variations on the Netflix business model, but I don't think they'll mail you the cars.